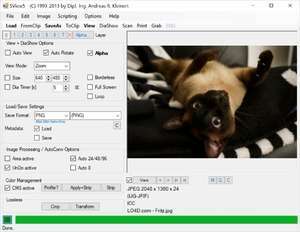 SView5 for Windows is an image viewer and converter with some photo editing features included. Upon first opening this application up, it appears to be a big mess of confusing terminology, therefore we would put this program in a category for advanced users. It offers a surprisingly large list of features, though it isn't the easiest of programs to use in its category. With SView5, you can convert your images to various different supported image formats and sizes. Version 3.86 is a freeware program which does not have restrictions and it's free so it doesn't cost anything. For security reasons, you should also check out the SView5 download at LO4D.com which includes virus and malware tests. Additional screenshots of this application download may be available, too.